E. coli DNA Ligase is a NAD+-dependent enzyme that catalyzes the formation of phosphodiester bonds between complementary 3'-hydroxyl and 5'-phosphoryl termini of dsDNA. 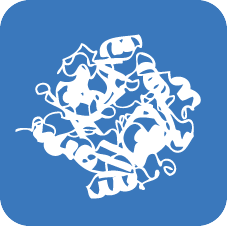 T4 RNA Ligase 2, also known as T4 Rnl2 (gp24.1), has both intermolecular and intramolecular RNA strand joining activity. 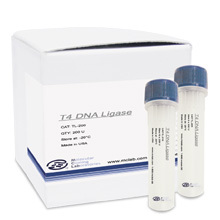 Unlike T4 RNA Ligase 1, T4 RNA Ligase 2 is much more active joining nicks on double stranded RNA than on joining the ends of single stranded RNA. The enzyme requires an adjacent 5´ phosphate and 3´ OH for ligation. Taq DNA Ligase catalyzes the formation of a phosphodiester bond in duplex DNA containing adjacent 5'-phosphoryl and 3'-hydroxyl termini, using NAD+ as a cofactor.